Wallflowers: Season 1 & 2 - On Sale! 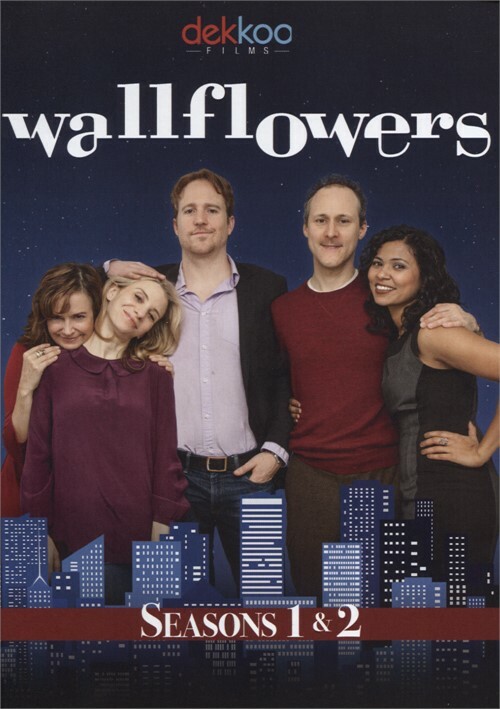 Set in the witty, cruelly comedic dating world of contemporary NYC, Wallflowers details the ensemble exploits of a tight knit group of jaded but hopeful Gen-X stragglers, coping with the ecstasy and the agony of dating life as members of a Manhattan support group for the hopelessly single. Self-described dating guru Janice Ackerman, has vowed to find love for each and every one of her students. Even if it kills them. An original comedy web series about a support group for people who can't get dates, Wallflowers is positively hilarious. This special edition DVD release collects the first and second seasons of the series in one set. The show blends gay and straight storylines seamlessly, but it's the adorable relationship between Bryce and Alex that keeps us coming back for more. The first season of "Wallflowers" introduced us to a group of New York singles that meet weekly for a support group catering to the romantically challenged. The show focuses on both gay and straight relationships and the discord and dysfunction of both. "In 'Wallflowers', there are straight, gay and bisexual characters. But they're characters first". The series explores what all these different types of people go through in their search to find love, and do it in the most honest way possible. Stereotypes of any kind, especially gay ones are insulting and reductive and it seems that sometimes our creative community relies on them way too heavily in order to get a laugh. "Wallflowers" is a charming comedy from Kieran Turner who introduces us to a diverse group of people who, for whatever reason, can't get dates. They are all members of the support group, "Navigating the Relationship Waters in the New Millennium," a kind of AA for the hopelessly single. Turner uses the group meetings sparingly and effectively to advance the narrative. Janice (Christianne Tisdale), the group leader, sets the tone. She is earnest, even when her group members think she may have gone crazy. Patch Darragh as Bryce nails the character as a world-weary, overly cynical, screw-you-guy. He is a pessimist by nature and jaded by the world around him. In the second season, Bryce has a new love interest after a really bad blind date from hell in Season 1 - a piano player named Alex (John Halbach). In the first episode, we learn just about everything you need to know about them. Bryce fights against his grim side while Alex is genuine. "Wallflowers" gives us the details of the ensemble, a tight knit group of jaded but hopeful Gen-X stragglers, coping with the ecstasy and the agony of dating life as members of a Manhattan support group for the hopelessly single.